DO YOU HAVE A PROBLEM WITH YOUR LANDLORD OR TENANT? Do you need help filling out forms for rent control or rent stabilization, tax abatements, or SCRIE? Every Thursday at Community Board 5 located at 61-23 Myrtle Avenue, just east of Fresh Pond Road, our Executive Director, Angela Mirabile, helps both tenants and landlords fill out forms related to housing and rent control and rent stabilization, and counsels them on eligibility for Section 8, Senior Citizens Rent Increase Exemption (SCRIE), and other rent assistance programs. If you are a landlord or a tenant and have a housing-related problem or need help filling out forms, call the Community Board at 718-366-1834 to make an appointment to see Angela Mirabile, or call GRRC at 718-366-8721 for telephone counseling. 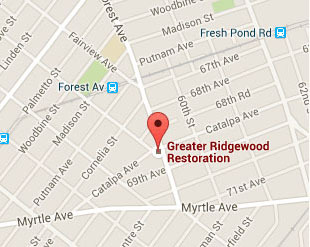 GREATER RIDGEWOOD RESTORATION CORPORATION CAN HELP YOU! Contact us and we’ll help you fill out all of the forms that the city requires to run your buildings. Read Online: click to go. Contact us, we can help you file building complaints and apply for senior citizen rent exemptions (SCRIE), Section 8, IT-214, and other city programs.